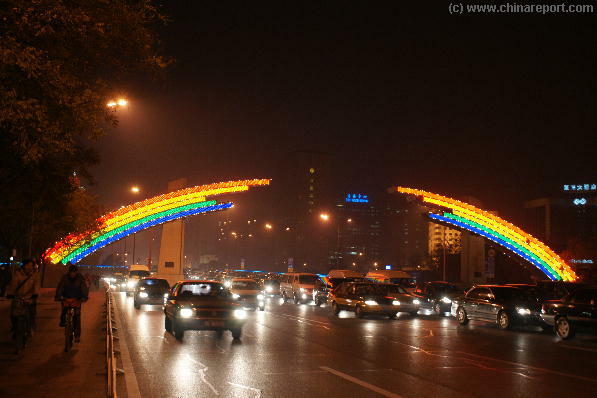 Cars line up at he the Crossing of Wanfujing Street and Chang An (Eternal Peace) Avenue. The Modern Architecture of OrientalPlaza dominates Chang An Avenue in the background. Traffic and Passersby at the Grand Hotel Beijing. Since 2000 the pollution makes the walk less and less comfortable. "History o/t Grand Military Review"
The Chang An Club at 10 Dongchang'an Jie , Home of the Party & Business Elite since 1996s, as seen from Grand Hotel Beijing. Schematic Map of the 1900 AD Legation Quarter and its defenses. Includes location of Main Legations and all of todays Legation Quarter historic remnants ! A Traffic Police Man directing Traffic at the Crossing of Chang An Avenue with Nanchizi Dajie' (Corner Grand Hotel Beijing) and Zheng Yi Road with its Green Middle Section. 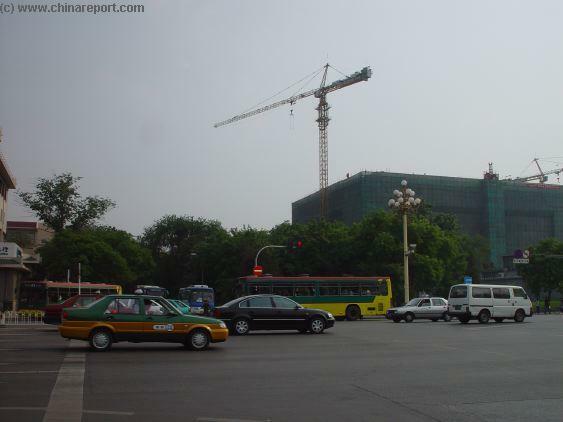 Mouse over Image - 1) Traffic and Construction at Zheng Yi Road/Chang An Avenue Intersection. 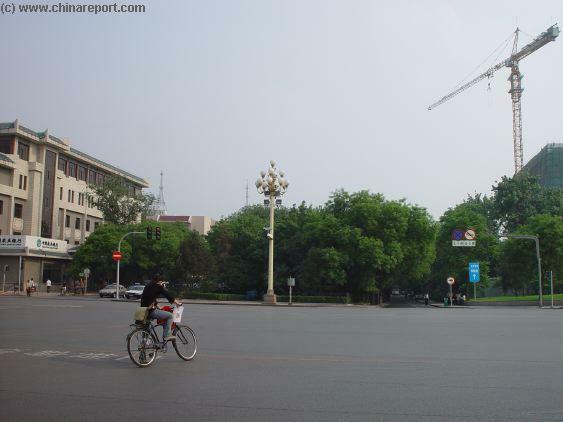 2) A View West along East Eternal Peace Avenue towards TiananMen Square. 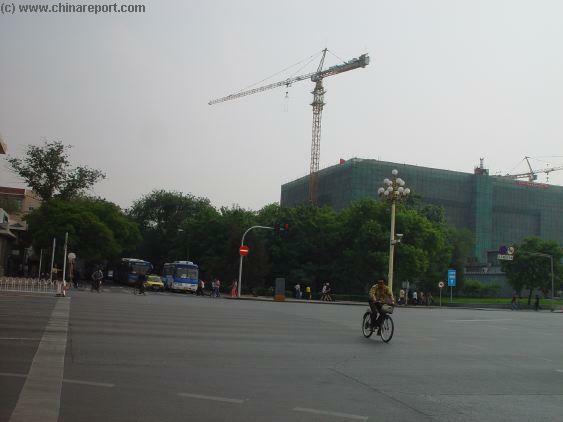 In the Distance the Gigantic National Museum of History is visible on the corner of TiananMen Square. 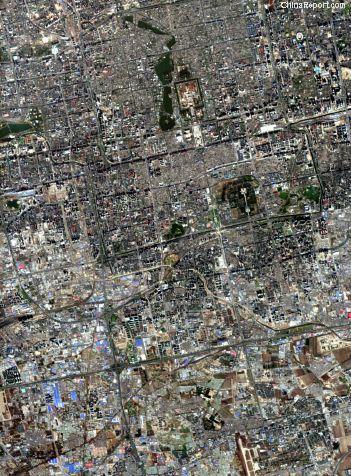 Satellite Image Map of Chongwen District and the southern-most part of DongCheng District, clearly showing the extend of East-Eternal Peace Avenue and the Streets of the (Former) Legation Quarter of Beijing. The Busy Traffic Lanes of Chang An Avenue are not only in use by Cars. Starting in the earliest morning hours, waves of bicyclists pass by on the way to work, delivery etc. Sundays are the quietest with the best morning rides. Corner of Zheng Yi Road and East Eternal Peace Avenue. A New and Modern Ministry building had been under Construction between here and the National Museum of History at TiananMen Square since digging started 2002 AD. 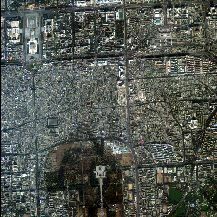 It had been completed by May 2006 and is Fully Operational. Main Entrance and Front of Oriental Plaza (Malls) on East Chang An Avenue - The Millenium Masterpiece of Beijing has been open since December of 1999 AD. The Tower of the Capital Hotel, the only highrise tower in the the Center of Beijing visible from East Chang An Avenue. 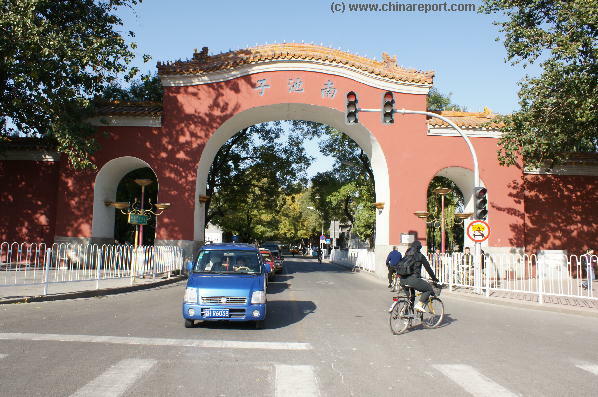 Chang An, or Eternal Peace Avenue is one of the Ancient Central thoroughways of the Old Imperial City. In history, it connected one of the Cities Western Gates with one of the Cities Eastern Gates, thus stretching across the entire width of the Imperial City. The two roads leading from the Gates into the City connected up at the Imperial Gate of Tian An Men, as it does today. 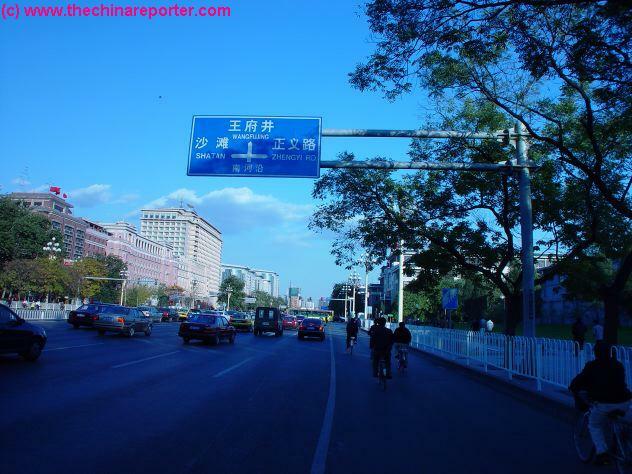 For ease, and Due to the Chinese Way of Name-giving for Roads, in practice Chang An Avenue is devided into two sections. West Chang An Avenue leads away to the West from TiananMen and includes the New National Theatre and the XinHua Men (Gate of new China). 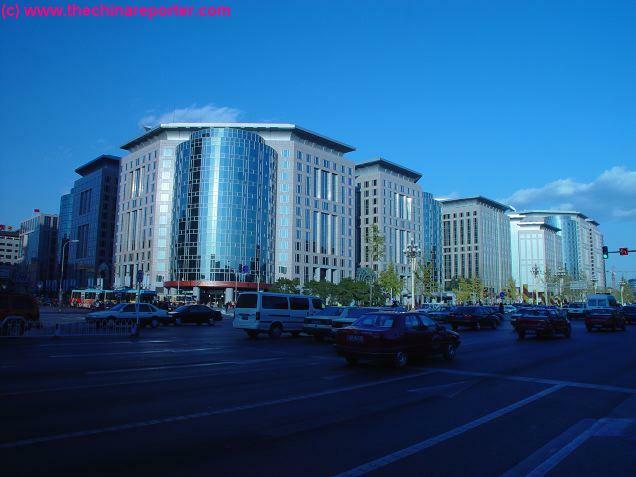 East Chang An Avenue, leads away from Tian An Men Gate to the East and passes the Former Legations Quarter, Grand Hotel Beijing, Wanfujing Street the Cities No.1 Shopping Street and Oriental Plaza. It ends at JianguoMen, the Site of the Ancient Observatory and the Eastern City Walls of the Ming Dynasty Capital. This Page holds an Introduction to the Eastern Section of Eternal Peace Avenue, Dong Chang An Jie'. View along Dong Chang An Avenue from TiananMen Square. In the distance Grand Hotel Beijing and Oriental Plaza the Malls. Traffic is about to be halted for the National Flag lowering Ceremony, held each sundown at TiananMen Square. Chinese History and the Museum of the Revolution (November 2002, 16Th CP Party Congress). Chang An Avenue is temporarily blocked off for traffic and plain-clothes police stand on the corners. 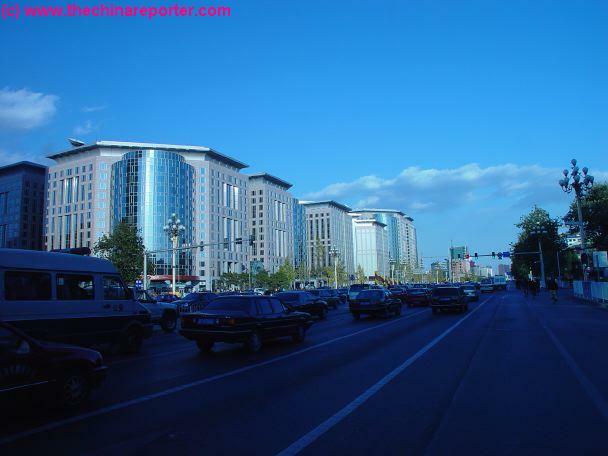 Chang An Avenue is the widest Boulevard in Beijing and in Asia Entire. 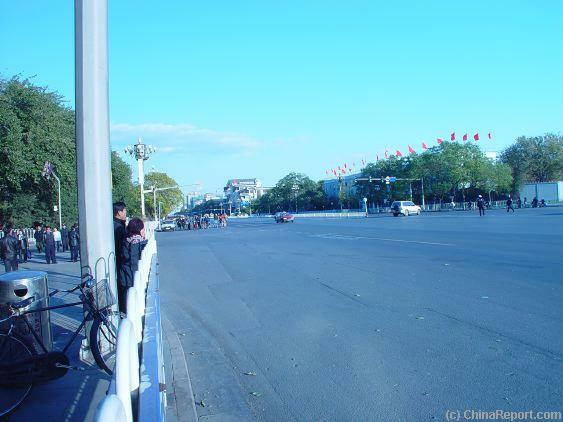 As the Main Boulevard of the City leading up to Tian An Men, even in 19Th and 20Th Century Beijing Chang An Avenue was number One among the Top International Streets of Beijing. It had the best scenic sights, important commercial and Government buildings and last but not least the now truely world famous Tian An Men, the Gate of Heavenly Peace. In this sense not much has changed at the Chang An Avenue of Today. 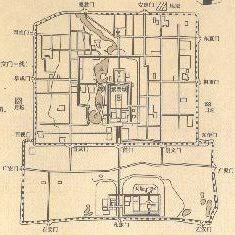 A Schematic Map of the Old City of Beijing in the Ching Dynasty -stuation as untill Summer of 1900 AD. 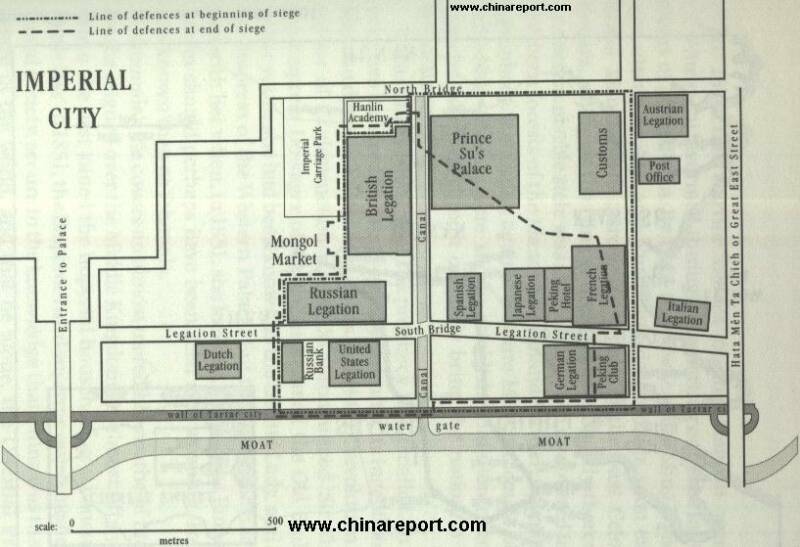 Further: The Ching Dynasty City Wall additions surroung The Xuanwu District and Chongwen District. 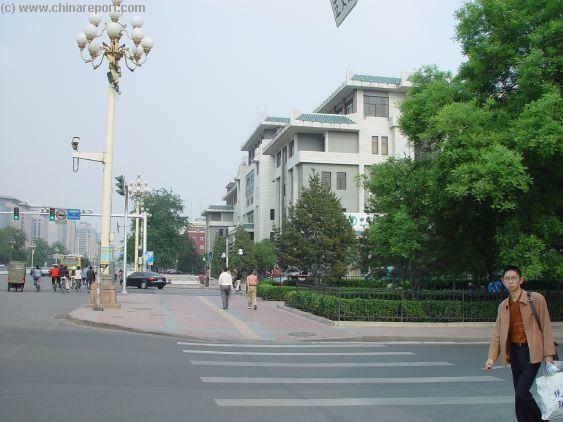 Because of its location, East Chang'an Avenue has been associated with a number of important events in Chinese history. Earlier in 1900 AD it was the dividing line between two warring parties in the Summer of 1900 AD Boxer Uprising. Sparse spectators watch while identical black cars are waved on by Police (Photo November 2002). Museum plenty of Government Buildings and Offices remain. 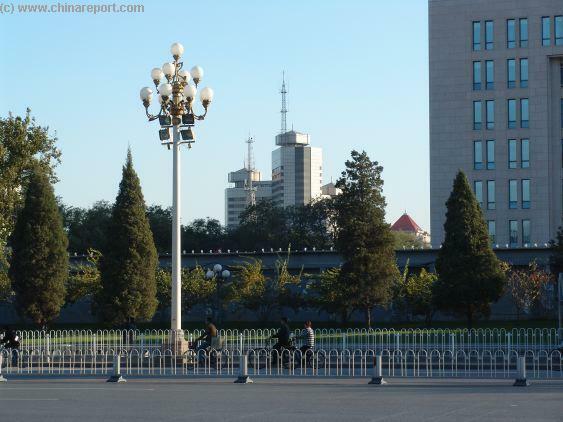 In fact, the entire section of Chang An Avenue wedged between TiananMen Square and East Chang An is home to the Beijing Municipal Government (City Province), as well as the National (Internal) Security Ministry and a number of other important Government Bodies. These are mainly located in what is know as the (Former) Legations Quarter. 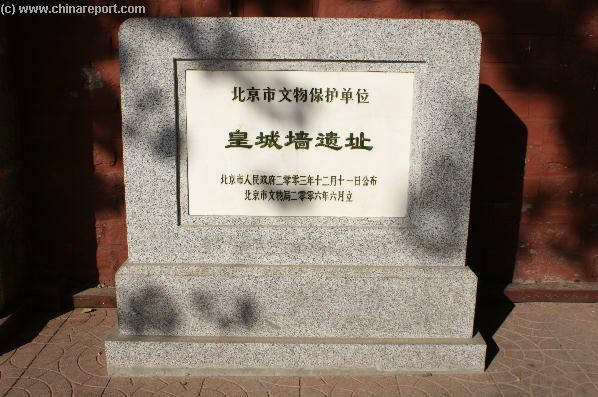 The First Street of the Legations Quarter to be reached from TiananMen Square following the Route of East Chang An Avenue is Zheng Yi Road, or the (former) Canal Street. 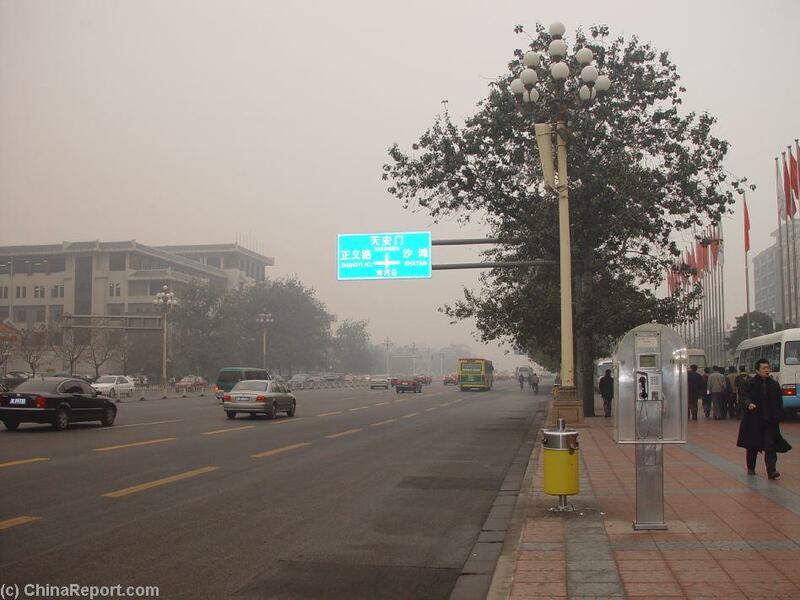 Chang'an Avenue of today has been lengthened again in the year 2000 AD. It now stretches from Tongzhou District in the East part of Beijing and the 5Th Ring Road to the Shougang (Capital Steel) Group Co. in far Western Beijing's Shijingshan District. The total length has been a staggering 45 kilometers (90 li) since the end of 2000 AD. This elongated super-Chang An Avenue, after having been reconstructed has been given the new and grandiose name of "Bai Li Chang Jie" (One Hundred Li Long Avenue). The new Avenue is flanked by lawns covering an area of over 50 hectares adding new Green to the Green Olympic City of 2008. A former Part of the Imperial Palace City of the Past, since 1949 AD the Park of the Peoples Culture is small and easily overlooked strip of green between Chang An - Eternal Peace Avenue and the Palace Museum of Today. From TianAnMen due East follow the flow of the Water while enjoying a garden landscape with rockeries, arched bridges and abundant flowers. Escape the City Heat and Noise at the Park of the Peoples Culture. North to the Ruins of the Ancient Dong 'An Gate. Dong An Gate was an Ancient Gate of the Ming Dynasty Imperial City. Somewhere between 1950 AD and 1955 AD the City Walls were demolished to make way for a ring road. The Canal leading away from the Imperial City underneath Chang An Avenue, heading down Canal Street became redundant and was filled in. In the same process the Ancient Imperial City Bridge was removed, strengthening the road for heavier traffic and among things the Famed Military Parades many remember from the 1950's, 60's and of course the Cultural Revolution Era. opportunity. This wide, tree-shaded Lane with a green middle section is Zheng Yi Road. At the corner was a bridge leading the Canal underneath Chang An Avenue. Furthermore, before 1950 AD and some time beyond, inside the Corner of Zheng Yi Road at Chang An Avenue stood a Gate into the (former) Imperial City. At this Point stood Two Gates. 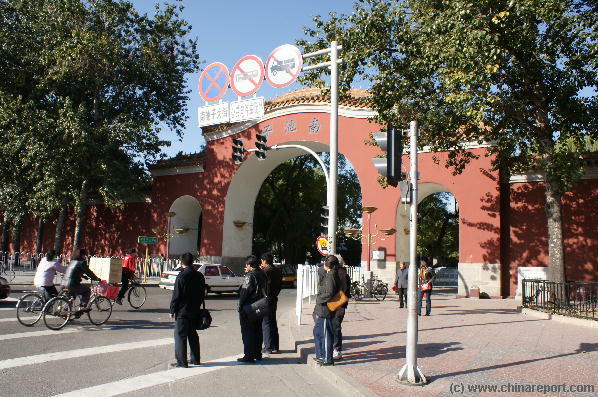 One Gate at the West End of the Bridge gave access to Tiananmen Gate and the much smaller Square of earlier Times. The Second Gate lead Northward giving access to Nanheyuan DaJie', as it does today. The Hutong in this section has been restored and is protected by the City Government. With the Park and the Palace Museum it is now a fancy place to live and home to up-scalers. Apart from some very good Catering the Area further offers Internatonal Art Exhibitions on Imperial Treasures and of course the Imperial Library Vault and Wanfung Gallery. Fu Wah International Group based in Hong Kong and a member of the National Committee of Chinese People's Consultative Conference. The Club hosts many seminars on China's and the WTO, finance and real estate, as well as conventions, business forum banquets. 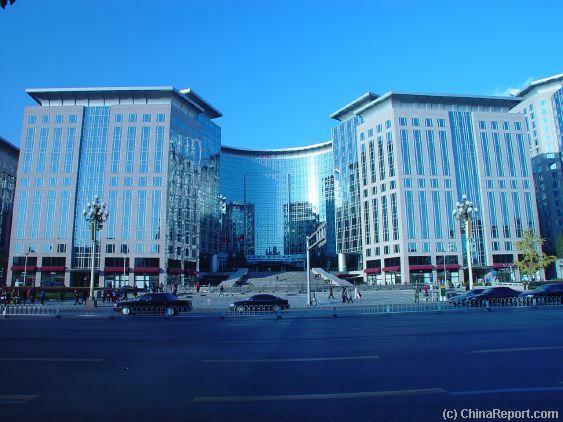 Further East along the Wide-Boulevard, conveniently located across from the Chang An Club stands the Grand Hotel and Beijing Hotel. Put together these connected Hotels, renovated in 2006 AD, fill an entire block along East Chang An Avenue. Mouse over Image 1/2 - Take the pedestrian walkway underneath ChangAn Avenue as it is completely irresponsible and illegal to try cross it on foot. View eastward along Chang An Avenue from Zheng Yi Road and Corner, in the distance Oriental Plaza is visible beyond the Traffic Lights. NanHeyuan Dajie'. East from NanHeyuan Dajie' begin the extensive grounds of Beijing's Oldest and Most Famous Hotel, the Beijing Hotel with adjoining Grand Hotel Beijing constructed in 1990 AD. The Beijing Hotel was one of the Main Hotels for Foreigners and Influentials since at least the 1920s and is still on Top of its Game. Among things, it has its own rooftop Restaurant with a unique view of the nearby Palace Museum. 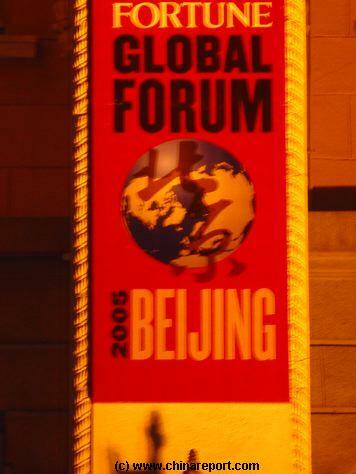 In May 2005 it was the Host of the Fortune 500 Global Forum, which was held in Beijing. An Avenue. It is also a nice section to start your bicycle Tour of DongCheng District. Next up along the South Side of East Chang An Avenue stands the Chang An Club. expensive cars can be seen parked in front. Three floors of the exclusive Club are dedicated to wellness, and facilities and services include two roof-top indoor tennis courts - with view of the Palace Museum, badminton, squash, aerobics, a large gymnasium, indoor swimming pool, Jacuzzi, sauna, steam-rooms, game rooms and massage. To accommodate business activities for its Elite Clients, the club offers its high quality international Staff, in-house secretarial services and all necessary supporting facilities. The Chang'An Club is well connected electronically to anywhere in the World. To Top things off the three subterranean floors include a spacious underground parking lot. You may not be surpised the Chang An Club was founded in 1996 as a Members only Club with a stringent dresscode. 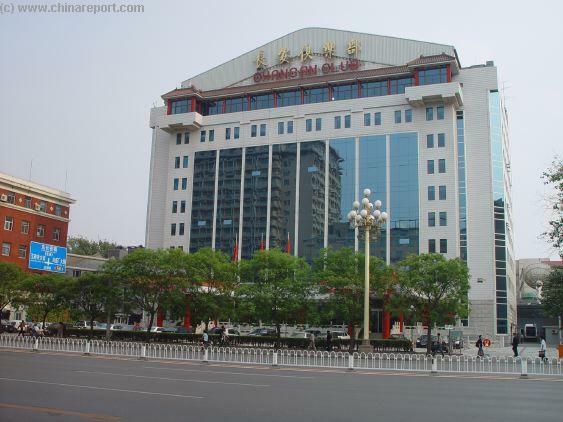 The Grand Hotel Beijing at East Chang An Avenue, filling an entire block. Its among the Most Exclusive Addresses in Beijing. The Eastern Corner lies at Famous Wanfujing Street, for long Beijing's Number 1 Shopping Street and revived in 1999 AD to Celebrate the New Millenium. is usually clogged with traffic. Commercial buildings in the Area of East Chang An Avenue abound. In December of 1999 AD, just in advance of the new Chinese New Year (Spring Festival 2000) but in Time for the New Millenium as well, a renovated and Modernized Wanfujing Street opened adjacent the New and proud Millenium Masterpiece of Beijing a.k.a. the Oriental Plaza, adding a wave of new luster to this entire Section of Beijing East of TiananMen Square. Eversince a revived Modern City Center has driven on Modernizations of DongCheng District and beyond. 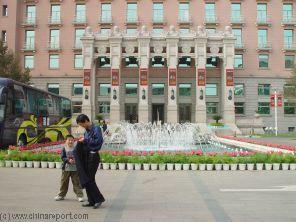 The Hotel Beijing (Peking Hotel) at East Chang An Avenue was the first International Hotel in Beijing. It was established at this location on the corner of Wanfujing,in 1900 AD, during the last Years of the Ching Dynasty. Inside the Plaza are extensive Shopping Malls, an entire blocks worth, as well as the Exclusive Hyatt Oriental Plaza Hotel en Business Apartments. Other features include a Large Cinema, the Beijing Rolls Royce Outlet, the Sony Explora-Science Museum and the Wanfujing Paleolithic Museum and Site. The Latter is a Small Museum found in the basement of the huge complex as it was during the construction of Oriental Plaza that this important Prehistoric Site was uncovered. The Museum is now a small shrine inside the huge complex, dedicated to the earliest inhabitants of this place that now is the Center of Beijing. Find out More on the Paleolithic Museum on the dedicated Report page. The Sony Museum is equally described on its own Pages as is Oriental Plaza. On the hot summers day of August the 8Th of 1937, East Chang An Avenue was the scene of the Japanese Victory Parade after the taking of Peking. strengthened and widened to allow for the heavy vehicles of a Military Parade. 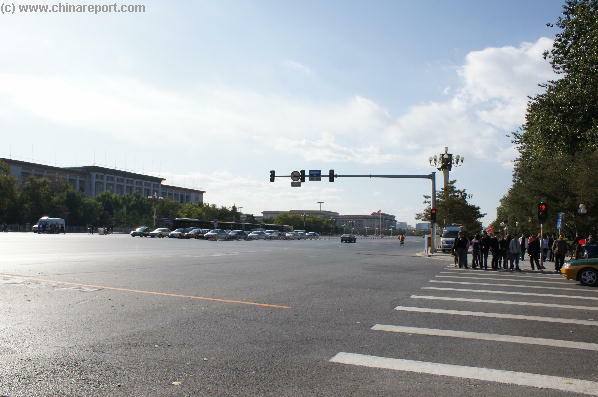 Eversince at least 3 Grand Military Parades have been held making Chang'An Avenue even more famous and especially famous to Foreign Military Observers during the later Cold War days. In the 1960s and 1970s the Mass protests and Marches of the Cultural Revolution continued the Legacy of this Grand Avenue. Other Historic Events include the funeral procession of Long March survivor, Veteran General and Revolutionary Icon Zhou Enlai and subsequent protests, and last but not least the Tiananmen Square protests of 1989 AD. You Tube - Chinese Made Computer animation following the entire length of extended East Chang'An Avenue (part of the 100 Li Road) in Beijing from Tian An Men and Square to the East (Chinese Language). You Tube - Flashback of Revolutionary Times including Premier Zhou Enlai among students and young communist party youth at Chang An Avenue and TiananMen Square. During the Major Birthdays of the Revolution and Birth of new China (The People's Republic), military parades are conducted on Chang'an Avenue, with the procession traveling from East to West along the Avenue, passing before Tiananmen gate and China's Highest Officials and invited Dignitaries. The Next one is expected on May Day of 2009 AD, in the 60Th Birth-year of the Nation. East Chang An Avenue ends at Chongwen Men Nei Dajie' and the Eastern Flank of Oriental Plaza. From this point it continues Eastward to the former JianguoMen Gate and the location of the Ancient Ming Dynasty Era Observatory (GuGuan XiangTai) which was part of the original City Walls. Beyond is the ChaoYang Business District, now a thriving section of the new City of Beijing. 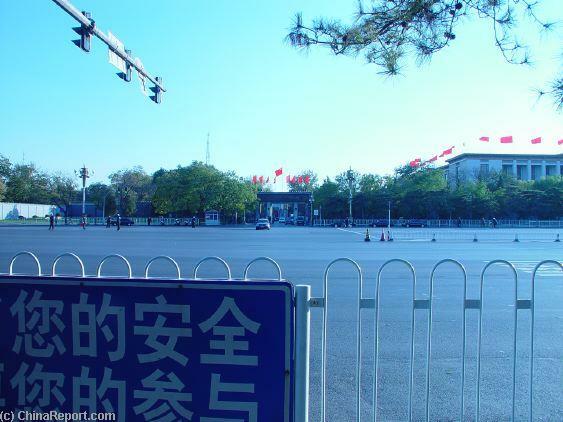 Make the Long Walk from TiananMen Square along East Chang An Avenue to end up at the historic end of the road during the Ming and Ching Dynasties, now located at the Eastern Entrances into Oriental Plaza and the Dongdan Bei Dajie'+ ChongwenMen Nei Dajie' intersection with Chang An Avenue. If you still have some strength left then you could continue onwards to the JianguoMen Intersection of the 2nd Ring Road and the Gateway into rapidly modernizing ChaoYang District. Marking the Ancient Ming Dynasty City Walls now demolished in this area, at this location stands the Ancient Observatory of the former Ming Court. Today it is an interesting Museum with exhibits on early Chinese Astronomical Inventions as well as the work of the earliest Jesuit Priest-Missionaries to the Chinese Court at Beijing. Visit the Beijing Ming Dynasty Observatory Museum, one of the rare relics of the first 15Th Century contacts between Europe and China as well as an interesting showcase of early Chinese Inventions. got a front row seat to main events around the Square, when on evening and night of June the 4Th, the Square was forcefully cleared of all protestors. 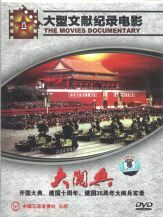 The Live TV coverage of the TiananMen Square protest and culmination was one of those historic events that made CNN the famed International TV News Station that is today. For China, the mentioning of the 1989 AD Democracy Movement and the Events at TiananMen Square are still a painful and heavily tabooed subject. Although important Politicians such as the late Deng Xiaoping who, as chairman of the Military Committee, ordered the crack-down have spoken on the subject, generally there is as little mention of the 1989 AD events and issues as possible. Government controlled Media shun the subject entirely and the subject cannot be found through computer searches from within China, due to its extensive "Great Fire-wall of China" internet censorship system. The State-owned and operated Hotel Beijing at East Chang An Avenue and Wanfujing Dajie' was opened in 1900 AD and Famous Since. Wanfujing Street is Beijing's Number One Historic Shopping Street. In 1999 AD, in expectance of a new Millenium and a promising Century for China the entire street was given a Modern Make-over, retaining Old Brands and bringing in new and Western Styles and products. Its booming Since. Clientele included most Foreign Visitors to Beijing. These were Dignitaries, Diplomats, Attaches, International Press and the Like. 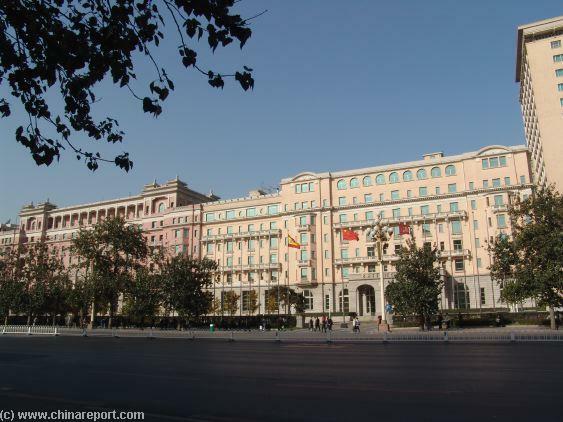 In the 1920's and 1930's, the Beijing Hotel was the preferred address of Foreign Correspondents, a Time during which the Hotel was mentioned several Times in journalistic accounts and even books as the only proper place to enjoy some Luxury in Beijing. 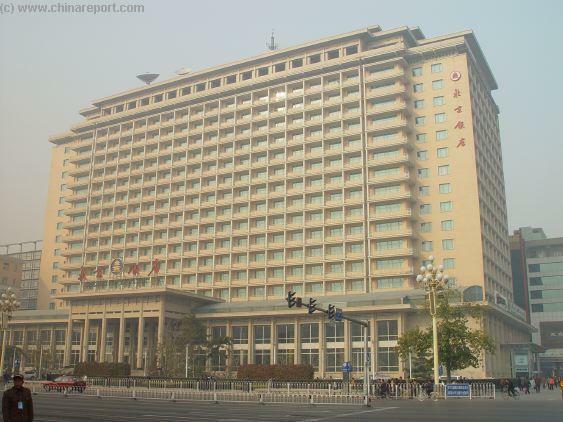 After 1949 AD, in the Peoples Republic of China, the Beijing Hotel was nationalized, but continued its Legacy as the Host to important Foreigners as well as the International Press. For 30 more years the Beijing Hotel continued its exclusive service, although less in the spotlight due to the closed nature of Chinese Society at the Time. Citizens and Students. While tanks were attempting to move in along East (and West) Chang An Avenue, International Reporters took their Chinese minders by surprise by swarming into the Streets and mingeling with the raging 100.000 strong crowds of angry citizens. The results were some very exclusive, dramatic and the Time unheard of Images, TV/Video as well as Photograhic. For the first time in the history of the Peoples Republic of China and the world truths and sentiments of an otherwise unknown and closed China were revealed to the general public in nearly entire world. 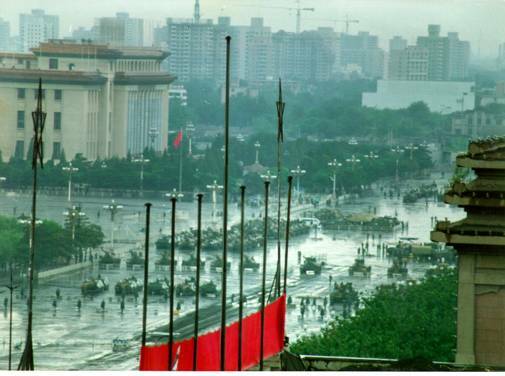 The Images from TiananMen Square, Chang An Avenue and from the balconies of the Beijing Hotel were sent (near) Live into the world by then upcoming Satellite Television News Station CNN, winning it an the Highest Press Awards for its unprecendented Journalism during these Events. CNN would go on to cover the equally unexpected Fall of the Berlin Wall later that same turbulent year and establish itself as the major International News Channel. As a by result, for China insiders, the Beijing Hotel grew even more Famous and Historic, although its majestic appearance was left stained and darkened by the infamous shoot out and other brutal events of those days.. 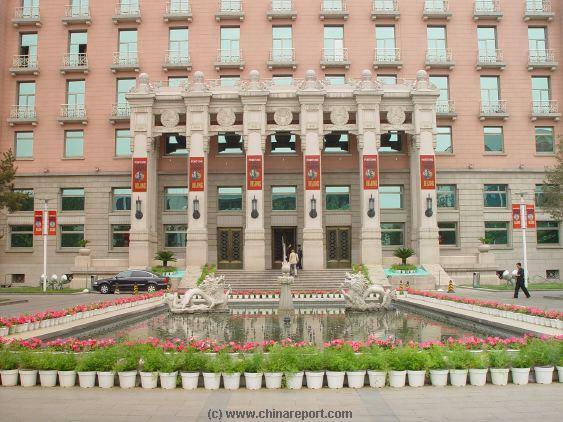 The Main Entrance of Grand Hotel Beijing, the westward extension of the renowned Beijing Hotel at East Chang An Avenue during the Fortune 500 Global Forum held in May of 2005 AD In Beijing. 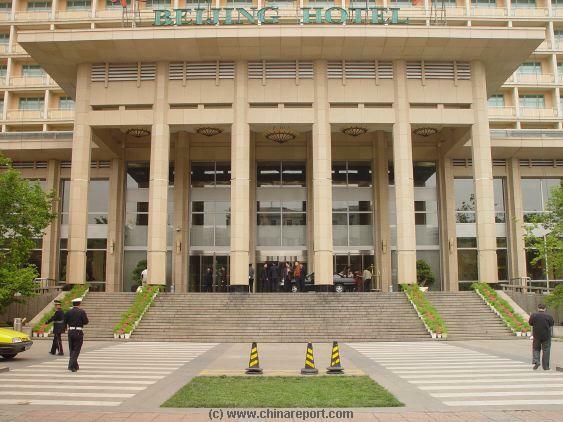 In 2005 AD the Beijing Hotel and adjoining Grand Hotel Beijing were the proud hosts of the Fortune 500 Global Forum, which was held mainly at the Hotel and nearby Venues. Eversince business has been truely booming, requiring a complete renovation and modern overhaul of the Hotel in 2006 AD. Todays Beijing Hotel is once more the scene for affluent visitors to Beijing, who prefer its location for its access to Luxury Wanfujing and Oriental Plaza, as well as the unique room views of the Palace Museum. The Unique features of Hotel Beijing (and the Grand Hotel) : The Zi Jin Hall, which is ordaned in the Luxurious Style of the ancient Imperial Palace with its Grand View Terrace, that can accomodate some 60 to 80 persons for an outdoor party with views of the magnificent Forbidden City Palace Museum. Tanks of The Peoples Liberation Army on Chang'An Avenue, seen from The Beijing Hotel in 1989. View from Chan An Avenue at Main Gate and Water Fountain. The Newly constructed Ministry of Public Security and the Gate into the Security HQ between the National Museum and the Ministry ( Photo May 2006). The End of the Old Imperial City proper, the JianGuoMen City Limits marker at Night (Photo November 2008 AD). Looking westward towards TiananMen Square from the Imperial City Gate. On the left the North-Flank o/t National Museum of History with further down the Great Hall of the Peoples at TiananMen Square (Photo November 2007).